If you’re looking to add some cozy seating area to your home, but can’t (or just don’t want to) spare any interior floor space for it, a window seat may be just the thing you need. Window seating gives you the space, does so while providing a pleasant and aesthetically pleasing setting, and can be done on a DIY program that requires only medium level carpentry skills. So here’s hoping that these tips on how to build a window seat helps you with finding and realizing the window seat design for your needs. 1. Start by cutting 2-by-4 lengths of wood that will serve as the three ledger boards that you will install along the walls of your bay window, under the windowsills. You need three because the outermost windows in the bay are set at an angle. The ledger boards will equal the length of each wall under each sill. Install the ledger boards flat against the wall. Meanwhile, miter the ends of the center board to the inner ends of the outermost ledger boards. 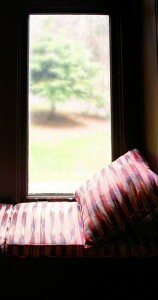 The miter angle of the ends depends on the angles in the bay area of your window. Also, miter the outside ends of the outermost ledger boards. They need to be plumb and flush with the crosspiece you will install later. 2. Now, secure the boards to the studs of the bay wall with 16-penny nails. They should be secured along the midline of each ledger board. In the case of horizontal studs, space the nails by 6 inches. Then, remove the baseboard or base trim along the bay walls. 3. You now want to re-create the above work, so that you have three more ledger boards the same dimensions as above. Install these ledgers along the bottom of the wall, where the baseboards or base trim sat. These are installed in the same manner. 4. Using lengths of 2-by-4 lumber, create top and bottom crosspieces. These form the frame for the front of the seat. They should fill the distance between the outside ends of the outermost ledger boards. Miter the ends so as to be sure the crosspieces of lumber are plumb and flush with the outer ledger boards. Secure the crosspieces to the outside ledger boards with nails. 5. You’ll now need a sheet of pre-painted pine board that fits snuggled into the crosspieces. This is the front of the window seat. Bear in mind that you will need to cut the side edges at an angle so the wood will seat flush against the walls. Cut a sheet of pre-painted pine board to create the seat. The board’s ends should have the same angles as the walls surrounding the windows so it has a snug fit. The front of the seat should extend over the front board by ½ inch. Secure the front of the window seat to the crosspieces of lumber using finishing nails spaced 4 inches apart. 6. Secure the seat to the ledger boards and crosspieces with finishing nails spaced 6 inches apart. 7. You’ll now want to cover the visible cut edge of the pine board along the front end of the seat. A good solution for this is to use matching iron-on melamine trim. Cut the trim to the required size; use an iron to secure it to the edge of the seat. Use a trim that matches the color of the pine board. Secure the trim to the wall using finishing nails spaced 6 inches apart. Secure the trim to the bottom of the front panel of the seat using finishing nails spaced 6 inches apart. We hope that these 7 tips on how to build a window seat give you the window seat design ideas necessary for you to set up the window seating arrangement that works best for your windows and your seating needs.